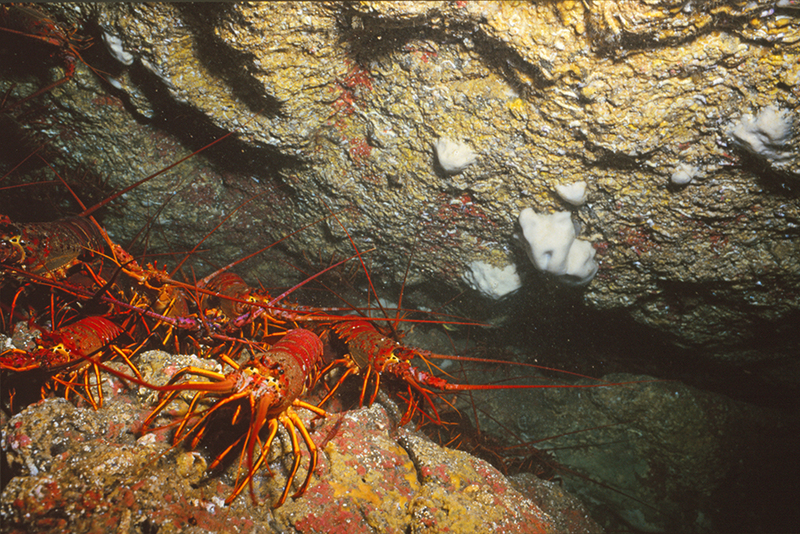 Lobster Diving Lobsters move into shallower areas near the end of the season, and if the swells aren’t too large, visibility inshore will be workable. Still, you will probably be looking at 3 to 4 feet at best. This shouldn’t deter you. Just take your time and be methodical and you will have a good chance of scoring somewhere in these areas. All the inshore rock rubble areas between Sunset Boulevard south to Santa Monica Canyon in depths ranging around 30 feet can produce well. I like to drop off on a hard bottom reading in that area and then work one way, north or south, zigzagging between the rock outcroppings looking for bugs. You can also drop off in about 25 feet outside the rock wall at the south edge of Topanga Canyon and weave the same pattern heading south. There are a couple of large rocks here, but the best producing areas are usually the smaller lower rocky strings that outcrop in the sand and run parallel to the beach throughout the area. This type of diving requires someone to follow you with the boat, but it allows you to cover a lot of ground. Other possibilities include Moonshadows inside and the rocky scrabble areas outside of Topanga. Halibut Halibut usually move into the Big Rock area mid-March. Whether you’re diving or fishing, the edges of the reefs from Las Tunas to Big Rock can produce some large flatties. Also, the mud bottom outside Moonshadows and south towards Big Rock in 50 to 60 feet of water can be productive. If the current and wind are right this is a great drift for fishing. Calico and Sand Bass If the water warms up, the bite will improve. My favorite spots this time of year include Deacons, the artificial reefs, the wreck of the Star of Scotland, and both Marina piles. Palos Verdes can be a good shot if you prefer Calicos over sand bass and you don’t mind the longer haul. Sculpin All the usual spots including most of the artificial reefs north of Marina Del Rey and the areas off Manhattan Beach in 40 to 70 feet of water should continue to produce. Rockfish Rockfish season reopens in March so the short bank off Manhattan and the deeper reef outcroppings in 250 to 350 feet along the drop off further out are good bets. Consult a chart of the bay and investigate the areas along the inside edge of the plateau outside of where an arm of the submarine canyon curves and cuts to the south outside of El Segundo. Other Possibilities It’s not unusual for barracuda or yellowtail to show up in the bay during March. The best area is usually right outside of Marina Del Rey. March is usually a good fishing month but just a fair diving month although we all know nothing is written in stone. If the weather improves and the water warms up, things can really get hot in the bay. It’s a good time to go to sea. We’ll hope for the best, and as always, we’ll take what we can get. Good luck on all of your diving and fishing adventures. This entry was posted in Salt Water Fishing, Santa Monica Bay Dive Spots and tagged artificial reefs, barracuda, Big Rock, calico bass, Deacon's, halibut, Hermosa Beach, lobster, Marina Pile North, Marina Pile South, Moonshadows, sand bass, santa monica bay, scuba diving, sculpin, shallow-water rockfishing, southern california diving, yellowtail. Bookmark the permalink.